Writers and tour guides all have their favorite “turning points” in the Civil War, so there are lots to choose from. But the “turning points” claimed are so portentous and deterministic that they demand almost impossible levels of proof. Less pretentious—and more realistic—are “critical moments,” events so clearly important that some effects can be reasonably inferred, without claiming they point to the war’s outcome. There are far more critical moments in the Civil War than "turning points." 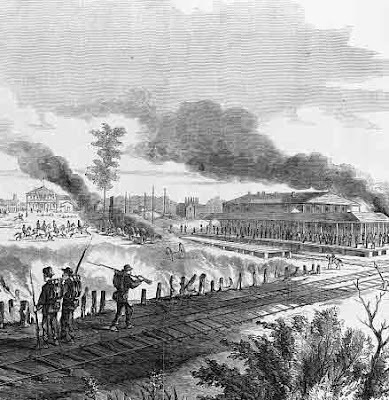 Two critical moments occur in the Western Theater after Halleck’s takeover on Friday, May 30, of the abandoned Confederate rail center of Corinth, Mississippi. With his massive force—100,000 or so soldiers, assembled from three separate Union armies—Halleck outweighs anything the Confederates could quickly assemble in the Western Theater. Forging ahead to deliver one great hammer blow to Beauregard’s ragged Rebels might crush Confederate hopes here once and for all. But on June 11 Halleck will give up his pursuit of Beauregard. The war will drag on. A critical moment lost. However, in the first days of June an even more important moment occurs here, one that will prove to favor the Union side. It happens like this. On Wednesday, June 3, William Tecumseh Sherman drops into Halleck’s headquarters to chew the fat and swap gossip, as soldiers of all ranks do. Halleck casually lets drop that Ulysses S. Grant— having asked for, and received, a 30-day leave—is leaving the very next day. Halleck claims to not know the reason why, which would make him the only senior officer not to know how Grant, as Sherman put it, “was chafing under the slights of his anomalous position.” It is hard to believe that "Old Brains" is that obtuse It is more likely he is jealous and distrustful of Grant and only too glad to see him go. A startled Sherman hurries to Grant’s camp, still in the piney woods outside Corinth. He finds office and camp chests piled up in front of the general's camp, ready for a departure, with Grant inside his tent, tidying up his desk. Sherman asks why he is leaving. By coincidence, one of the great military confrontations in history is foreordained by events this week. Hundreds of miles to the east, Maj. Gen. George B. McClellan’s Union soldiers and Gen. Joseph E. Johnston’s Confederates are fighting to a draw at Seven Pines (or Fair Oaks) in Virginia. Johnston is seriously wounded on the first day of the battle and is immediately replaced by a man named Robert E. Lee. So far in the war, Lee has shown little promise of success on the battlefield. Grant has shown more, but at the moment he is at one of the nadirs of his career. But in two years, thanks to critical moments occurring within days of each other in Virginia and Mississippi, Grant and Lee will become the two most prominent commanders of the Civil War. They will fight some of its last battles and help to bring it to a close. But not before many other critical moments have passed. He didn’t want to do it—fight on a Sunday, that is—but nonetheless on Sunday, May 25 the very religious Maj. Gen. Thomas J. “Stonewall” Jackson attacks Union Maj. Gen. Nathaniel Banks’ harried Federals at Winchester, in the Shenandoah Valley. Jackson was forever invoking God’s mercy as he rode into battle and, before this day was over, he must have concluded he had been graced with it this time. Outnumbering the Union soldiers 2 to 1, Jackson’s Confederates deliver a smashing blow, killing, wounding, or capturing a fourth of the 8,019 bluecoats and capturing a rich trove of supplies. But as Banks’ men retreat through the streets of Winchester and flee towards Harpers Ferry, two other Union armies—one under Frémont, coming from the west, the other under McDowell, coming from the east—are hoping to cut off Jackson. By Thursday, May 29, Jackson is near Harpers Ferry, where Bank’s 5,000 men wait. Behind Jackson, however, are John Charles Frémont’s 15,000 men and Irvin McDowell’s 20,000. Is Jackson trapped? Not likely. Once again demonstrating the quickness that is making him famous. Jackson slips away. In pouring rain on Saturday, May 31, he escapes the looming entrapment, slipping southward between Irvin McDowell and Frémont before the Federal forces could converge. “First Winchester” (as the battle is known because of later engagements in the same place), is a major strategic victory for the Confederates. It forced the Union to divert McDowell from reinforcing McClellan on the Virginia Peninsula, and keep him positioned so he could defend Washington if Jackson turned in that direction. In his Peninsula Campaign, on Saturday, May 31, McClellan finally gets into a battle, without asking for it. He splits his force, putting three of his five corps north of the Chickahominy River—supposedly to unite with McDowell. Needed to defend Washington, McDowell, of course, is going to do no such thing. Confederate commander Joseph E. Johnston thinks he sees his chance to attack a weakened McClellan, so he attacks the two Union army remaining on the south side of the river. This is the battle known as Seven Pines or Fair Oaks. After some initial success, the Confederate attack fails and, worst of all, Johnston is seriously wounded and must leave his command. To replace Johnston, CSA President Jefferson Davis dispatches his own military adviser, a relatively unknown Virginia gentleman named Robert E. Lee—and the rest is history…at least in the Eastern Theater. Confederate commander P.G.T. Beauregard knows the jig is up and he must save his army. Thanks to poor water and unhealthy living conditions, many of his men are sick and his defenses are weak. Throughout Thursday night, May 29-30, trains rush in and out of Corinth, carrying away the Confederates to Tupelo, about 50 miles south. As each train arrives, the Confederates cheer, leading some on the Union side to think Corinth is being reinforced. But then, deep, rumbling explosions are heard. The Confederates are blowing up their ammunition dumps. (Pictured above) On Saturday morning, May 30, Union soldiers cautiously enter Corinth and find it deserted. Halleck’s advance has ended successfully—for Halleck—but much of the glory has been lost because of the slowness of his advance. What Halleck does next, however, will be far worse. In the days to come, he will throw away one of the war’s greatest opportunities. Stonewall Jackson already as shown how fortune favors the bold. Halleck will demonstrate how little caution can favor the Union. The author of THIS WEEK IN THE CIVIL WAR will be out of town, travelling (in the Northern states, of course), so “This Week” will cover TWO weeks. Since this edition describes Halleck’s ponderous advance on Corinth, it is suggested you get in the spirit of things by reading this v-e-r-y s-l-o-w-l-y. For the first few days of the Union advance on Corinth, Maj. Gen. Ulysses S. Grant watched silently as Maj. Gen. Henry W. Halleck’s orders to the Army of the Tennessee and the reserve corps—both nominally Grant’s commands—whizzed by him as if he didn’t exist. Told after the Union victory at Shiloh that he was now Halleck’s second-in-command, Grant must not have realized it meant this. Julia’s response is unknown, but Halleck fires back a reply that is mostly malarkey. He insists Grant’s powerless second-in-command role is the right one for him (which it isn’t) and that he, Halleck, had spent the past three months defending Grant (only if you don’t count Halleck’s own effort to undermine Grant following Fort Donelson). 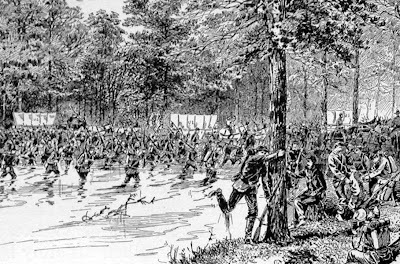 Halleck cannot bring himself to frankly explain to Grant that he is being punished for the Confederate surprise at Shiloh. A public outcry had demanded that something be done about that close call, but President Lincoln had declared, "I can't spare this man; he fights.” Hence, the de facto suspension, unaccompanied by candor on Halleck’s part. Of course, Halleck's reply does not satisfy Grant. Over the next few weeks he keeps repeating his request to be relieved from duty. Repeatedly, he will be refused. Meanwhile, Halleck’s combined command—a total of 100,000 men from Pope’s Army of the Mississippi, Buell’s Army of the Ohio, and Grant’s Army of the Tennessee—will slow down in its advance on the Beauregard’s Confederates at Corinth, Mississippi. When Norfolk, Virginia, falls to McClellan’s Army of the Potomac, President Lincoln wires the happy news to Halleck, adding, “Be very sure to sustain no reverses in your Department.” He needn’t have worried. After a quick start, Halleck’s cautious nature takes command of the advance on Corinth. Now, this huge force only inches forward, a sluggish giant that seems to be burrowing its way to Corinth, throwing up earthworks every time it stops. On average, this Union army advances only a mile a day—and sometimes less. Years later, a veteran of the 68th Ohio will remember how working parties of soldiers would labor mightily to build vast earthworks and bastions, inwhich the army would pause only for a day or two, and then advance a short distance--sometimes only half a mile--to repeat the process all over again. Part of the time, heavy rains fell on the troops, turning the ground to mud and forcing soldiers to help mules drag the army’s wagons forward. Soaking wet, the soldiers slogged through mud, pausing here and there to pour the water out of their boots (pictured above). Now and again, there would be skirmishes and sharp little engagements—but no head-on confrontation with Beauregard’s main force of Confederates. The division led by Maj. Gen. William Tecumseh Sherman—emboldened by his success at Shiloh—gets so far in advance of the rest of Halleck’s forces that it comes within a mile and a half of Corinth. There it settles to watch and wait, while Halleck creeps in its direction. Realizing he faces overwhelming force (thanks to dirty water and malarial conditions, much of his army is sick and out of action), Beauregard begins evacuating his troops by train. When the empty trains return, his soldiers are ordered to cheer loudly. The train traffic and the noise suggest that Beauregard is being reinforced. That suggestion, combined with Halleck’s natural caution and the memory of two days of hard fighting with the Confederates at Shiloh, is more than enough to delay occupation of Corinth until May 30. With little to do, Grant wanders about the various Union camps, visiting one general and another, among them, Sherman, who had served him well at Shiloh. Years later, Sherman would recall that Grant rarely complained, “but I could see that he felt deeply the indignity, if not insult, heaped upon him.” It showed when Grant snapped at his beloved Julia in a letter about their personal finances. *Grant and Sherman: The Friendship that Won the Civil War (New York, 2005: Farrar, Straus and Giroux). ELSEWHERE, MAY 11-24, 1862: With no refuge left for its famous ironclad, the Confederates are forced to scuttle the CSS Virginia (known to Northerners as the Merrimack). Having recaptured New Orleans for the Union, Farragut’s flotilla moves up the Mississippi in what will turn out to be a futile effort to reclaim the river from the Confederates. In New Orleans, the occupying Union general, Benjamin Butler, issues his infamous Order No. 28, declaring that ladies in the city who insult Union troops will be treated like prostitutes. On the Virginia peninsula, Confederate Gen. Joseph E. Johnston keeps falling back under pressure from McClellan. President Jefferson Davis is increasingly worried about the impending threat to Richmond. In the Shenandoah Valley, however, Stonewall Jackson’s “foot cavalry” is moving aggressively in search of the Federals, and on Friday, May 23, Jackson captures Front Royal, after a sharp little battle. Meanwhile, the work of a growing nation goes on, as President Lincoln approves establishment of the Department of Agriculture on Thursday, May 15, and on Tuesday, May 20, signs the Homestead Act, granting free land to settlers in the West. AUTHOR’S NOTE: Effective April 25, “Blood, Tears, and Glory—The American Civil War, Day by Historical Day, changed to a weekly format, presenting a summary of that week’s events in the war. While the emphasis will continue to be on the Western Theater, all major events in the war will be recognized. The bad news for the Confederacy keeps getting worse. Threats press in from every side. In the Western Theater, over 100,000 Union soldiers under Maj. Gen. Henry W. Halleck are heading for Corinth, Mississippi, intent on capturing that vital rail junction. In the Eastern Theater, another 100,000 Federals, led by Maj. Gen. George B. McClellan, is on the Virginia Peninsula, with the Confederate capital of Richmond its objective. After a month of standing still while planning a siege, McClellan’s Army of the Potomac finally enters Yorktown, Virginia, on Sunday, May 4. Just as McClellan was moving big siege guns in place in front of Yorktown, Confederate Maj. Gen. Joseph E. Johnston and his smaller army slipped away, leaving the door open. McClellan calls his near bloodless siege “brilliant,” but Johnston’s army remains intact, simply moving westward, towards Richmond and, briefly, out of McClellan’s range. On Tuesday, after a small, sharp fight, advance units of the Union army enter nearby Williamsburg as well—but Johnston keeps falling back. On Thursday, the Confederate government gets a little good news when Stonewall Jackson scores the first victory of his Shenandoah Valley campaign. In the battle of McDowell (or Bull Pasture Mountain) Jackson’s 10,000 Confederates push back 6,000 Federals under Brig. Gen. Robert Schenck, an Ohio “political general.” Now Jackson will start moving north to gain more successes in the Valley. His objective is to tie up Union troops who might otherwise bolster McClellan’s Army of the Potomac on the Virginia Peninsula. Already, Jackson is developing a reputation for moving fast and hitting hard. Soon the name of “Jackson” will be feared in the North. But there is more bad news for the Rebellion’s government. On Friday, feeling the pressure of McClellan’s 100,000-man invasion force nearby, the Confederates abandon their important naval and army base at Norfolk, Virginia. It is a severe loss. Although the retreating Confederates try to burn as much as they can (the abandoned, burning Norfolk is pictured above), considerable booty falls into the hands of the Federals, who enter Norfolk unopposed on Saturday. While visiting the Peninsula, President Lincoln watches Union troops moving into Norfolk and Portsmouth, Virginia. So things are looking up for the Union, but all is not well. McClellan’s army will slow down again, and so will Halleck’s. Historians will look back at all this, not so much as a time of Union success, but of lost opportunities. 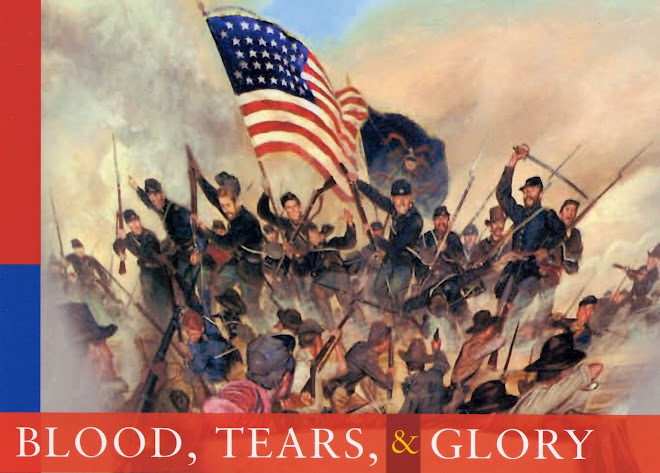 AUTHOR’S NOTE: Effective April 25, “Blood, Tears, and Glory—The American Civil War, Day by Historical Day, changes to a weekly format, presenting a summary of that week’s events in the war. While the emphasis will continue to be on the Western Theater, all major events in the war will be recognized. Since January and Zollicoffer’s humiliating defeat in southern Kentucky at Logan Cross Roads (Mill Springs), every month has brought more bad news for the Confederacy. There have been crushing losses at Forts Henry and Donelson, Pittsburg Landing (“Shiloh”), and Island No. 10. Now there are looming threats by Federal armies on the Virginia Peninsula, in the Shenandoah Valley, and on the approach to Corinth, Mississippi. And, as if to dramatize the Union’s skyrocketing ascendancy, Federal authorities have just opened a big prison camp in Ohio primarily for Rebel officers and it is filling rapidly. The camp is on Johnson’s Island, in Sandusky Bay on Ohio’s Lake Erie coastline. The island contains about 300 acres, partly wooded, and is about 2 and ¾ miles from the small city of Sandusky, which is 66 miles west of Cleveland. Construction of the camp began in November 1861 and the first trainload of 200 Confederate prisoners arrived in Sandusky on April 11, 1862, via a special train. The Sandusky Register described them as a varied lot, many of them short and thin, wearing a mixture of clothing of various styles and colors, and displaying attitudes that ranged from swagger to sullenness. When it opened, the prison consisted of 17 buildings. It occupied a compound of 14 or 15 acres surrounded on three sides by a plank fence and on the fourth by a high picket fence. Sentinels occupied two block houses, one at the main gate and the other at a far corner of the fence. The first barracks for prisoners were one-story framed wooden buildings covered with shingles, divided into rooms of various sizes, heated with stoves. Wood for construction and, later, for firewood, was found on the island itself. Storehouses, a hospital, kitchens, and mess facilities were also built inside the stockade, with a garrison house for the guards outside the fence. Altogether, Sandusky is the least disagreeable prison I saw or ever heard from. The officers in command are civil and courteous—the lake breeze robs the summer sun of his heat, the view of the city, lake and neighboring islands is fine, the restrictions on prisoners are few, and altogether it is a salubrious, pleasant place. A typical day for prisoners began with breakfast at 6 a.m., with roll call at 7:30 conducted at each barracks by a member of the guard. Dinner was at noon and supper shortly before sundown. A band composed of guards played several selections at 9 p.m. and at 9:30 taps were sounded and all lights put out. At first, food and creature comforts were plentiful. Ice and milk were distributed after breakfast, sutlers entered the compound to sell fruits, vegetables, and newspapers for sale, and mail came at mid-morning. A general store sold items at fixed prices. Rations, firewood, and clothing were also distributed in the morning. Prisoners were free in the afternoon to play games, sleep, walk, or make trinkets. In warm weather, prisoners—under guard—were allowed to bathe in the lake, and the Sabbath was observed as a quiet time, with religious services. However, as reports reached the North of hardship endured by Union prisoners in Confederate hands, rations and privileges were periodically reduced in retaliation. Other problems, including hygiene, arose as the war went on, but hardship at Camp Chase never approached that suffered at Andersonville prison in the Confederacy. By the end of the war, the Johnson’s Island prison had grown to 100 buildings housing as many as 2,600 male prisoners—and, in disguise, at least one women. Federal authorities were surprised when one of their prisoners gave birth to “a bouncing baby boy.” For the most part, however, life at the Johnson’s Island prison camp proceeded quietly until the end of the war—with one exception. In September 1864 the prison was the object of a Confederate operation known today as “The Lake Erie Conspiracy.” But that is a story for a later date. 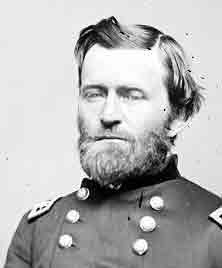 ELSEWHERE IN THE CIVIL WAR: Sunday, April 27, was Maj. Gen. Ulysses S. Grant’s 40th birthday, a day of which he made no special note but spent instead with routine duties arising from his Army of the Tennessee, encamped at Pittsburg Landing. On Saturday, May 3, an unusually ebullient Halleck wired Secretary of war Edwin M, Stanton that “our army will be before Corinth to-morrow night.” Halleck’s three armies will, in fact, make steady progress for a few days. But then Old Brains’ natural caution will kick in, and the advance will slow to a crawl as Halleck worries about being caught off-guard and orders his men to entrench themselves every step of the way. Reduced to glacial speed, Halleck’s huge army will not occupy Corinth until the end of the month. Meanwhile, on the Virginia Peninsula, another hyper-cautious Union commander, Maj. Gen. George B. McClellan, brings up siege guns and prepare to bombard Yorktown.. Before any serious damage can be done, however, the outnumbered. Confederates, under Maj. Gen. Joseph E. Johnston, evacuate Yorktown on Saturday, May 3. That renders the siege guns useless and McClellan’s long-delayed advance of the Army of the Potomac a waste of time. In the Shenandoah Valley of Virginia, Stonewall Jackson changes direction and heads for the Federals near Staunton. Within days, Jackson’s brilliant “Valley Campaign” will be underway, going down in the history books as a military exercise still worth studying a century and a half later.